Clip-on extensions works with even shortest length of hair.You can put the clip on extensions even if you have too short hairs. Now you have to choose the suitable length. All the hair we sell id 100% human hair with no artificial mixing. You can wash it, dry it, straighten it or curl our hair extensions as they are just like your own hair. Clip in Extension are the greatest way to instantly increase length of the hair, color some strands and increase the volume of your hair. These extensions can be easily applied to your own hair in minutes without help of a hair stylist. They are very easy to use and you just bend the clip to snap open and shut it with your own hair. This hair comes majorly in its natural color natural off black or brown. 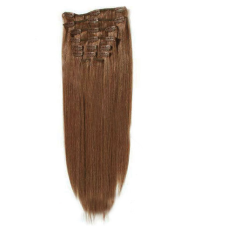 Remy hair is collected with the cuticles align in the same direction just like your own hair. This ensures to have long-lasting and easy to handle hair extensions. virgin Remy hair clip ons 14" 1 BundlePack 1 BundlesWeight 100 gms ( each hair extension 100 gms)St..
virgin Remy hair clip ons 16" 1 BundlePack 1 BundlesWeight 100 gms ( each hair extension 100 gms)St..
virgin Remy hair clip ons 18" 1 BundlePack 1 BundlesWeight 100 gms ( each hair extension 100 gms)St..
virgin Remy hair clipons 20" 1 BundlesPack 1 BundlesWeight 100 gms ( each hair extension 100gms)Styl..
virgin Remy hair clip ons 20" 1 Bundle$95.00Pack 1 BundleWeight 100 gms ( each hair extension 100gms..
virgin Remy hair clip ons 24"1 BundlesPack 1 BundlesWeight 100 gms ( each hair extension 100gms)Styl..
virgin Remy hair clip ons 26" 1 BundlePack 1 BundlesWeight 100 gms ( each hair extension 100 gms)St..
virgin Remy hair clipons 28" 1 BundlesPack 1 BundlesWeight 100 gms ( each hair extension 100gms)Styl.. 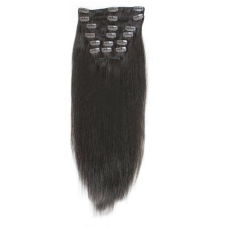 Pack 1 Bundle Weight100gms ( each hair extension 100gms)Style straight Fiber100% Virgin In..